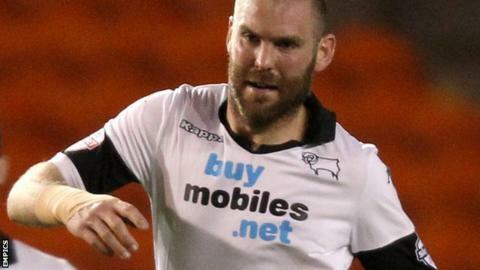 Jake Buxton's selection as a fans player of the year is well deserved, according to Derby boss Steve McClaren. The central defender, 29, has finished top of a supporters' club poll. Derby fans have nicknamed Buxton "Buckenbauer" after former German international Franz Beckenbauer because of his passing from the back. The former Mansfield Town trainee arrived at the club in 2009 after helping Burton Albion win promotion to the Football League. "Bucko is what you call an old-school professional," McClaren told BBC East Midlands Today. "You know what you are going to get day in day out." McClaren added: "He's low-maintenance, gets on with his work and is a winner. He has got himself an opportunity and is playing well in the team." Buxton was brought to the iPro Stadium by McClaren's predecessor, Nigel Clough, who was also his boss at Burton. He is just three away from 100 starts for the Rams and has featured in all their games this season. "He has really really improved and his performances have been excellent," said McClaren. "Not just that, but his leadership both on and off the field in the dressing room and around the place. "He has that old-school honesty that should never go out of the game. He tells it how it is."